This is my newest personal EDC knife! It is amazing how light it is in your pocket! Just how light can a full-sized tactical knife be? Thanks to advanced materials this, sleek, incredibly sharp beauty almost defies gravity. Barely two ounces! But almost 8” overall. So light, so slim, yet so strong. You’ll never want to let it get away. Thumb stud and integral frame lock mechanism for smooth, fast one-hand operation. Almost unbelievably light weight…for such a heavy duty knife. The carbon-fiber-clad companion to the Anti-MC also features a super sharp ceramic blade and unbelievably, an even lighter carry! Its super durable carbon fiber handle is not only incredibly light weight, but also provides outstanding stability and elegance. The combination of advanced materials and clean design gives makes this slim, sleek knife an outstanding performer…and a truly effective tool. The incredibly sharp hi-tech ceramic blade makes quick, clean cuts and provides superior edge retention compared to steel blades. Plus it’s 100% corrosion-resistant, non-magnetic, chemically neutral, and extremely easy to clean. 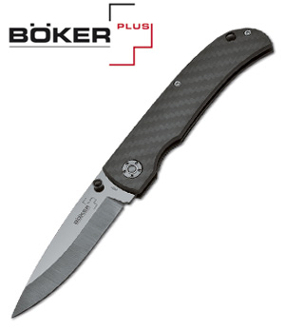 The thumb stud and integral frame lock mechanism make one-hand operation as smooth and fast as this knife looks. Includes pocket clip and lanyard hole for convenient carry and secure handling. Blade length: 3¼". Overall length: 7¾". Weight: 2.1 oz. Ceramic Blades require very little maintenance. Just maintain common sense. Boker Ceramic Knives are ultra-sharp—and hold their extraordinary razor-like edge more than 10 times longer than normal steel knives. They’re 100%corrosion-free, non magnetic, easy to clean, even dishwasher safe. They need little maintenance and no special care. But remember that a knife is a cutting tool—not a screwdriver and not a prying tool. So like any fine blade, ceramic blades should not be should not be twisted, pressured laterally, or used to cut hard objects like bone. If you keep that in mind, your Boker Ceramic knife will provide many years of exceptional performance and satisfaction.